The challenge this week at iheartfaces is "slice of life." My husband had the day off on Friday, the weather was AMAZING, so we decided to go on a hiking trip with our kids. We had a blast! 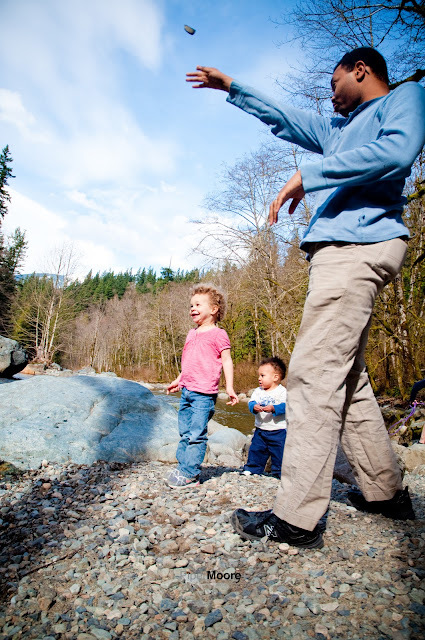 We went to Twin Falls, which is great for kids both on feet or being carried in a pack. On our way back down we stopped by the river to let the kids throw some rocks, to get a picture of them together and to attempt a family picture with the camera timer. While I was setting up the camera on a rock, using other rocks to prop it up just right, I decided my husband and kids were having way too much fun not get get a shot of them. So, I turned my camera vertical, fired a shot, and hoped for the best. This is a slice of the life I love...impromptu day trips, lots of fun, and all with the wonderful family I am blessed to call mine. I also caught my girl being natural, which is special these days. I am sure many of you understand the silly cheeeeeeeeeeeeeeeeeeese smile of a two year old. Thanks for looking! I would love to see the work of those visiting my blog so be sure I have a way to see your entry. Also, I am working on my business facebook page, so if you like my pictures I would love for you to follow me by clicking on the facebook logo at the top right of this blog and please share tips/ideas about fun/unique/and not overly annoying ways of building up a facebook page. I love those slices of life too! Awwwww! They are having so much fun, they could care less the camera is out! !